Enjoy comfortable laptop-like typing on your favorite 9-10 inch tablet. Logitech Universal Folio locks your tablet at an optimal angle for typing and holds firm on any surface from a desk to your lap. Designed to protect your tablet from everyday wear and tear including spills. Universal Folio is easy to setup, and features a reliable Bluetooth 3.0 connection. Keyboard sleep mode preserves power of the long lasting 2-year battery. Dedicated function and shortcut keys work with iOS, Android, or Windows, making Universal Folio an indispensable tool for tablet lovers. A unique 4-point grip holds most 9-10 inch tablets securely and elegantly including iPad, Android and Windows tablets. The grip feature is so innovative, we've patented it. Universal Folio also features an integrated pencil holder to keep your stylus or pencil within easy reach as you swap in and out of tasks. Enjoy hours of comfortable, flexible typing thanks to large well-spaced keys stretched edge-to-edge so your hands won't feel crowded. Key travel of 2 mm provides the optimal depth for speed and comfort. Dedicated function and shortcuts keys for iOS, Android or Windows let you control the tablet without leaving the keyboard. Universal Folio is designed according to Logitech's tough engineering standards. Built for years of everyday use, it features durable materials that hold up to constant use and occasional mishaps. A special strap securely closes your iPad and keeps it closed while being jostled around in your bag. Ready when you need it, Universal Folio uses replaceable coin cell battery to power the keyboard. Thanks to a smart power management system, it lasts up to 2 years without a need to replace it. 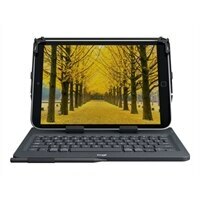 Advanced Bluetooth provides a reliable connection that won't drop between tablet and keyboard. Setup is easy - three simple steps take about a minute to complete.